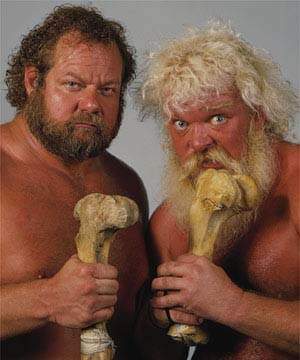 By the time I started really watching wrestling in 1984, the Moondogs had become nothing more than enhancement talent, but these two mangy men had quite a reputation in the early 80's. Moondog Rex and Moondog King won the tag team titles in 1981. During their reign, King had to leave the company over visa issues and was replaced by Moondog Spot. The Moondogs were a tough team, with shaggy hair and shredded jeans. Lead by then bad guy manager, Captain Lou Albano, they carried giant bones to the ring and didn't hesitate to use them on opponents when the opportunity arose. In the early days of their gimmick, their bite was worse than their bark. Like I mentioned at the start of this post, most of my memories of Rex and Spot were putting over other guys. I remember a young Barry Windham and Mike Rotunda beating the Dogs on their quest for the WWF tag team gold. 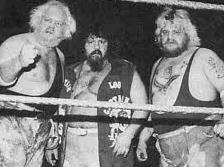 The Moondogs eventually split and Rex was actually an original member of Demolition. Randy Colley played the role of Smash, but legend has it that his face paint wasn't quite good enough and fans chanted "Moondog!" when they saw him. Add that to the fact that he had contract issues with the company and he was soon out and replaced by Barry Darsow. Moondog Spot would head south and work in the USWA where he was paired with new dogs, including Spike and Cujo. They were a force to be reckon with under the management of Richard Lee. The vicious dogs feuded with crowd favorites like Jeff Jarrett and Jerry Lawler. Spot, who was played by Larry Latham, died in the ring back in 2003 after suffering a heart attack. He was 51 years old. Through the years other members like Splat, Max, and Mange were added to the mix. There's no denying these guys were some of the most brutal during their time in wrestling.